In several articles written a couple of months ago, you learned what cargo vans are the first choice for many tradesman and fleet managers in the US. The list includes Sprinter, Transit, ProMaster, Savana, NV and few smaller counterparts mostly equipped with petrol engines. In this article, we'll show you another side of the story – diesel cargo van. Are they actually cargo vans with best mpg? Let’s make parallel and quickly compare vans with pickup trucks. It seems that diesel engines are much more popular with truck guys. And there is a good reason for this. Truck drivers who tow and haul heavy loads every day need torque. A diesel engine is way torquier than the petrol sibling. The second reason why truck drivers prefer diesel is fuel economy. The third is engine longevity and durability, and the fourth is the resale value of the vehicle. Does this apply on work vans as well? Is many ways, yes. But before you do search on Google “diesel cargo van for sale” think about your specific needs. How many miles do you drive monthly? Does your vocation demand to tow a significant number of bulky items or trailer? And finally, are you looking for new or used van for work? If your choice is used, things are way less complicated. New diesel van cost a few thousand dollars more than the same model with a gas engine. That is why you can save a lot when buying used diesel work van. 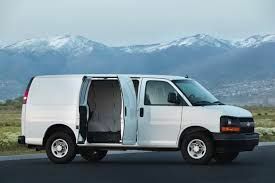 There is a tone of Duramax vans, two or three years old, in perfect shape and condition, with full maintenance record waiting to become your faithful sidekick in every construction, plumbing, electrical, delivery or HVAC project. Enough with the intro, let us introduce the best new and used diesel cargo vans to buy in 2019. 3.2L is actually smallest engine in complete Transit range. With 3.2L turbocharged Power Stroke diesel engine, Ford's full-size cargo van delivers 185 HP and 350 lb-ft. of torque. Peak torque is in range of 1,500 and 2,500 rpm which makes this van perfect choice for delivery services and those who drive in the stop-and-go environment. This is 5-cylinder engine made from cast iron and aluminum. All diesel models for the US are rear wheel drive. Since the debut in 2015, this engine sets the standards for reliability and longevity. It is manufactured in Ford plant in South Africa, precisely in Port Elizabeth. A diesel engine is paired with a six-speed automatic gearbox. This combination is enough for hauling 4,300 lb. of cargo and towing 7,500 lb. Massive Transit 350HD High Roof Diesel reaches fuel economy of 21 mpg which is an outstanding achievement considering it has the aerodynamics of 35-floor building. With this fuel economy, Ford Transit is maybe the best mpg cargo van at the moment. Used diesel Ford Transit cargo van from 2015 is possible to buy for slightly under $24,000. We are talking about high roof 350 HD model. This is a reasonable price for the van that costs around $37,000 as a new. This version with a long wheelbase and an extended roof is very popular among plumbers. Cargo space is perfect to upfit with shelves, drawers and ladder racks. What are Ford Transit diesel main competitors? Nissan does not sell its NV with a diesel engine. In a full-size segment, there are Chevy/GMC vans, Mercedes Sprinter and Dodge RAM ProMaster. Mercedes Sprinter is the first van that is available with diesel engine since its debut. Their famous 6-cylinder, 3.0L powerplant is capable of producing 189HP at 3,800 rpm. Paired with the 5-speed automatic transmission it has 3500 lb. payload capacity and 5,000 lb. towing capacity. 3.0L turbo diesel is introduced in 2017. This engine replaced old 2.1L, 4-cylinder from 2014. The smaller 2.1L engine has two turbochargers. It's paired with a 6-speed automatic transmission. The engine from 2014 is capable of 22 mpg on open road. That is a slightly better fuel economy compared to 2017 model. Some drivers say the old engine is more reliable too. Although Sprinters for the US market are manufactured in Argentina, or better say assembled, engines are produced in Daimler factory in Berlin, Germany. The potential downside of Mercedes cargo vans is price and expensive extras. New Sprinter cost up to $5,000 more than Ford Transit. Used Sprinter Cargo is, on the other hand, one of the most popular work vans on the market. Very well equipped Sprinter from 2015 is possible to find under $27,000. The price includes air condition, power seats and windows, heated seats, tow package, Bluetooth, and all safety features which makes Sprinter top quality fleet vehicle. Diesel engines are available in all wheelbase and roof configurations. In 2016 Fiat developed a new engine for North America's market. It was 3.0L, 4-cylinder turbocharged diesel that produces 174 HP and 295 lb-ft. torque. ProMaster with a diesel engine has a very unusual transmission. It is not manual, and it's not an automatic one. Ram says it is "automated manual." According to RAM engineers, this type of transmission brings the functionality of automatic and efficiency of a manual gearbox. For those who don't mind changing gears manually, there is a manual driving mode. This is the only full-size cargo van that has front wheel drive. Average fuel economy for ProMaster diesel is 21 mpg. The engine doesn't make vibration like in other diesel cargo vans, and the noise level is very low. Back in 2014 ProMaster diesel had a price of $42,000. Today, you can find a perfect model from 2015 under $23,000. The great thing about RAM ProMaster is you can choose many wheelbase and roof options. They are quite well equipped with a rear camera, traction control, power windows, airbags, ESP, tie-downs in the cargo area, tire pressure monitor, trip computer and keyless entry. Chevy and GMC basically sell the same model but with a different logo on the front grille. Both Savana and Express look old fashioned, but they share fascinating small diesel engine. 2.8L, 4-cylinder Duramax can produce 181 horsepower and healthy 369 lb-ft. Maximum payload capacity is 3,269 ft. and all models equipped with Duramax diesel engine are RWD. Engine is B20 diesel capable and has a powerful tow-haul brake which is the convenient option when towing heavy load on roads with high inclination. The same engine (produced in Thailand) is used in GMC Canyon and Chevy Colorado pickup trucks. Unfortunately, GMC and Chevy allow you to choose the only wheelbase; there is no option to extend roof height. Starting price for new diesel Chevy Express is $33,060. Used diesel examples are not so popular like gas 6 or 8-cylinder versions, and it's tough to find one. It's evident that Chevy and GMC are losing cargo van battle against main rivals. Is it because of 20 years old design or something else it's hard to say, but it's evident that streets become more and more packed with Transits and Sprinter vans. If you have decided to upgrade your fleet with diesel cargo van visit Fleetworks of Houston, Inc. Our lot is packed with “like-new” work vans and pickup trucks in fantastic condition and great prices. We are highly motivated to find the best commercial vehicle for your business. Please stop by our dealership and let our reps introduce vehicles and special financing plans.